After pulling Hallowed Fountain and Breeding Pool from pre-release pack, I decided to make my next commander deck Bant. 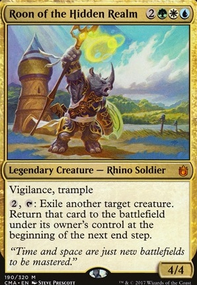 I chose Roon of the Hidden Realm as my commander because he looked like a fun commander. I decided to go with the blink strategy. Plan is to abuse all the great ETB effects like Mulldrifter , Terastodon and Trostani's Summoner ; try to perma exile with Fiend Hunter , and possibly steal stuff from others with Perplexing Chimera . And of course double the ETB effects with Panharmonicon . Deck has instances and other effect to exile and return things like Cloudshift and Angel of Condemnation if Roon is not in the battlefield. Ephara, God of the Polis and Guardian Project helps with card draw.